Corresponding with the impending launch of its new marketing campaign, Spice Island appointed Thajithangani Dias, better known as Thaji as its new brand ambassador. Thaji is no stranger; she is the youngest granddaughter of ‘Chitrasena & Vajira’ and is the principal dancer of the Chitrasena Dance Company and a teacher at The Chitrasena School of Dance. ‘Traditional dance’ and the practice of indigenous holistic medicine has always been part and parcel of Sri Lanka’s history and culture. Being born to a family devoted to reviving the traditions of ancient dance, Thaji, personally exhibits many of the brand values of Spice Island, and was therefore identified as the perfect fit to represent the brand. Her simplicity, elegance, spirit and passion as an individual resonates the core values of the brand through her versatility to perform an ancient traditional dance form as polished contemporary dance theatre. The philosophy of tapping into ancient tradition to present something of value to contemporary society essentially mirrors the essence of the Spice Island brand. 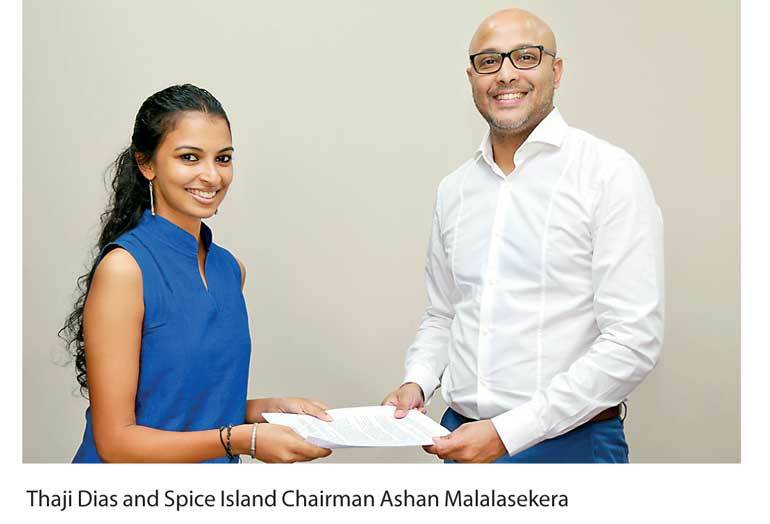 We endeavour to dig deep into the secrets of ancient healing and create unique products that are relevant to the modern consumer,” said Spice Island Ltd. Chairman Ashan Malalasekera. With the launch of its new marketing campaign, Spice Island will incorporate and combine the practice of yoga in collaboration with Thaji to portray the brand – as the epitome of relaxation and wellness. The new campaign will emphasise the brand’s core values as it embraces a new, refined identity, poised for new and greater developments to come in the near future. In addition to the brand association with Thaji, and with the aim of promoting national heritage and culture, Spice Island also joins forces with the Chitrasena Kalayathanaya in sponsoring a scholarship program to recruit aspiring dancers who want to train and become professional traditional dancers and cultural ambassadors of our country.